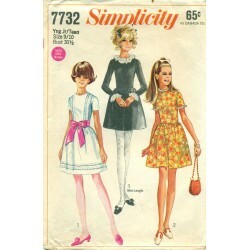 1960's vintage sewing patterns. The decade where fashion starts out just like the 1950's and ends with a 1970's look. If a date is not on the pattern, it can be difficult to tell sometimes which era it is is from. Not to be out done by the others, the 1960's can certain claim the mod style all for it's own!Mini dresses and skirts where the hem line is above the knee. Sometimes way, way above. Counteracted by the long, floor length "midi". Large bouffant hair styles. Crazy necklaces and earrings. It was a crazy time with the craziest, wild colors and fabrics. Also, the emergence of a quieter, hippie style. All of this can be seen in the patterns for sale here which you can easily buy.Patterns which are not uncut and still in factory folds are checked and counted. Occasional duplicate in stock. Otherwise, one of a kind, authentic vintage. I do, also, include the occasional modern, retro reprint from companies like Butterick and Vogue.I am always adding new stock, so check back often. *1960 - 1969 There are 81 products. Evening and day dress sewing pattern from the 60s! 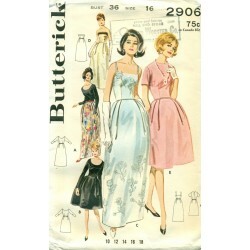 Butterick No. 2906. 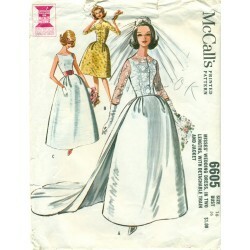 You can sew lots of different dresses with this pattern. Fitted bodice, sleeveless, short sleeve, long sleeved. 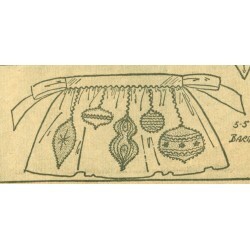 The bell shaped skirt has a nice corded waist. Long, floor length and knee length choices. 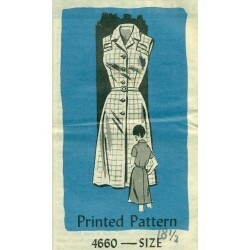 Sew a dress for day or evening with this vintage pattern! 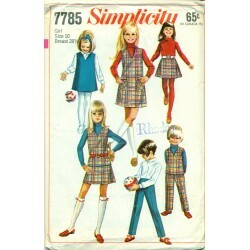 Vintage, girls sewing pattern for a jacket and dress with pleats! Square neckline and long lined bodice. Nice full skirt with pleats. Jacket is lined or unlined and has welt pockets. Sew it with matching or contrasting fabric. Create a nice jumper style dress and jacket with this Simplicity sewing pattern! Nice and comfortable! 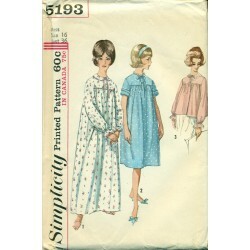 Short or long nightgown sewing pattern from Simplicity. 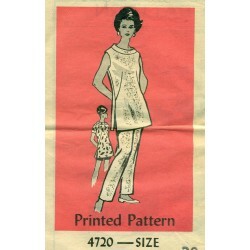 This vintage pattern even includes a bed jacket for those of us who like to read in bed at night or to go with your favorite pair of pajama bottoms. This Advance dress sewing pattern has a slim, wiggle style skirt. Blouson style bodice with 3/4th length and short sleeves. The slim skirt has a pleat in back for easier walking and movement. Button up front with nice wide collar. 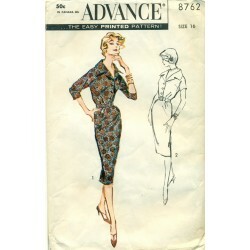 Classy and classic styled dress vintage sewing pattern from Advance. Have fun making and creating your own purse from the 1960's! 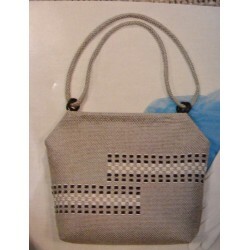 This kit is for the Wonder Weave Handbag from the National Handcraft Institute and is from their Fad of the Month Club. Everything you need to create this lovely bag is here. 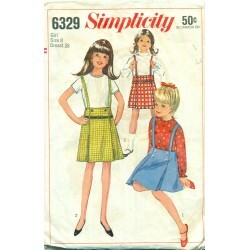 Very versatile sewing patterns for little girls! From Simplicity, this pattern has a great sleeveless jumper which can double as a top depending on the length. The A-line skirt and pants have partial elastic in the back and side zipper. 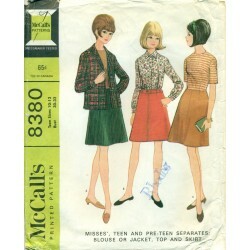 Mixed and matched, there are so many different fashion looks with this one pattern from the 60s! Not just for teen's (but also women) this vintage sewing pattern is for a full circle skirt, sleeveless vest style top, and short sleeved blouse. A "simple to make" pattern from Simplicity. Make yourself something great for the office or career to wear. Sleeveless and short sleeved are two versions you can make with this vintage sewing pattern from the Kansas City Star. Half sized pattern if you happen to be in between two different sizes. Close fitting with an A-line skirt. Nice detailing on the bodice near each shoulder. Not just for little girls - this pattern is also for women! 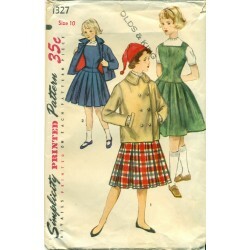 Several versions of above the knee skirt pattern. 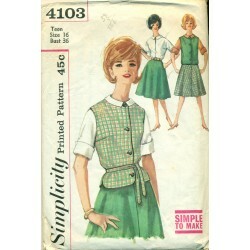 Make with suspenders, patch pockets or with an inverted pleat in front. Decorate and embellish the suspenders, pocket or add trim in fun places. From Simplicity and the 1960's. Create a something nice for work or play - young and young at heart! Create a cute little outfit to keep your little one warm and comfortable with this vintage sewing pattern from Simplicity! 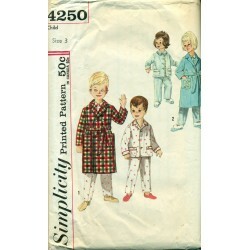 The long sleeved robe has patch style pockets - as well as does the pajama top. Elastic waistband. Set-in sleeves on both the robe and pajama top. 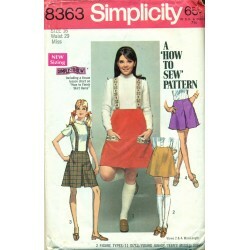 The sleeveless or short sleeved top in this vintage sewing pattern from Anne Adams doubles as an above the knee dress. Nice styling with long darts in the front which adds shape to the tunic. Sew the pants shorter as shorts to go nicely under the dress for a summer outfit. 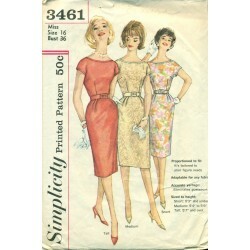 Vintage, Simple to Sew dress pattern from the 1960s! Simplicity 7385. Nice A-line style dress. 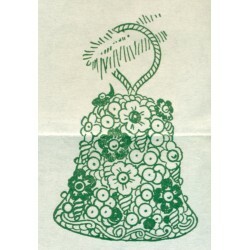 Two styles of sleeves to sew - short or long bell shaped. Zipped back closure. Fun, button trim near the left shoulder. 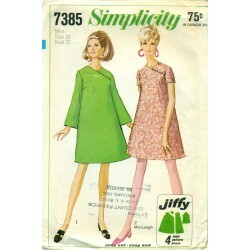 Sew yourself a dress in no time with this jiffy, Simple to Sew pattern from Simplicity! 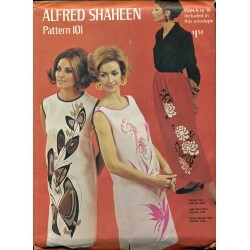 A very nice 60s mod sleeveless dress and hostess skirt sewing pattern by Alfred Sheehan.